Tight! 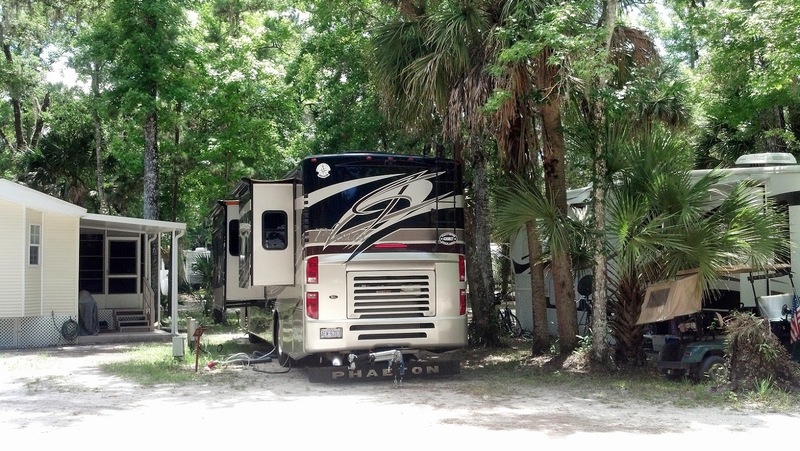 We moved farther south to New Smyrna Beach, Florida to a camp ground called Sugar Mill Ruins RV Park. 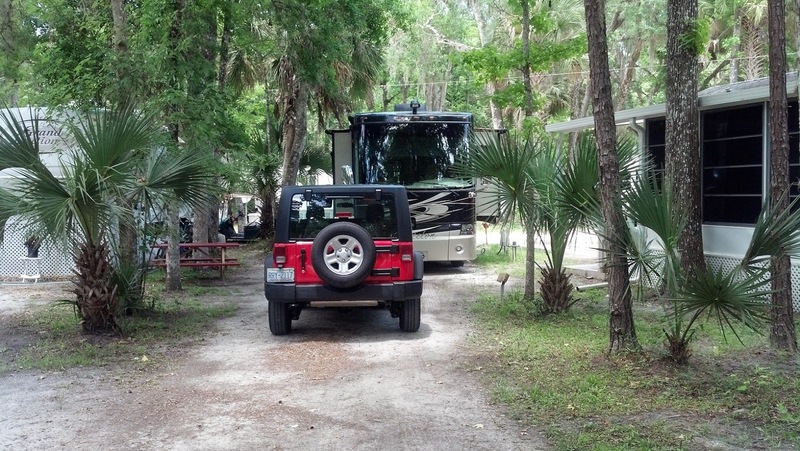 It is a quaint and charming campground but it is NOT big rig friendly. There are some sites that can take a 40 or 42 footer but not with their toads. There are a lot of permanent lots with park models and permanently placed trailers. Lots of old trees and plenty of shade. Tree branches were not a problem but the trees themselves have gotten large and protrude into the sites. We had to make a very tight hairpin turn just to get on our street but we did not have to detach Hope. However when we made an even tighter turn into our site, our water and sewer bay did not line up with the campsite's utilities. So Hope was sticking out in the street if we were to line up with the sewer and water. So we had unhook Hope and move her to the front of Phaeth. With Hope unhooked, we went shopping at a nearby Publix. Joanie had a real hankerin' for sea food so she bought 2 pounds of fresh shrimp at $14.50 a pound. Now that's an expensive hankerin'. But she also bought fresh corn and tomatoes and she cooked an early Sunday dinner that was exceptional! The location reminds me a lot of Jacksonville where we lived for a few years. The flora, humidity, and soil is the same and I feel very much at home here. But everywhere we go now is "home"!